What an exciting time of year! It’s a great sight entering SunBird, driving towards the clubhouse and seeing the multitude of activities taking place in and around the area; golfers playing on the course, tennis, pickleball, shuffleboard and horseshoe players having fun using the outdoor recreational facilities, water aerobics in the large swimming pool, exercise and walking classes in the ballroom, billiard room players, card games, ceramics, lapidary, people using the Wi-Fi service in the clubhouse, people relaxing reading books or completing puzzles and people coming for some good food or a cool beverage at the restaurant. SunBird is truly an active adult community with plenty to keep everyone busy. November was an extremely busy month with several social activities and fun events. The 19th annual SunBird Community Day was a huge success. The attendance was as big as ever with approximately 800 people passing through. The ballroom was packed with 92 booths of SunBird organizations.endors and service companies. All seven of our Board of Director candidates were also present to meet and greet those in attendance. Also, during the month of November, dances were hosted in the ballroom every weekend, karaoke and music in the Horizon Room, Thursday Night Trivia, Friday Night Bingo, a Kare Bear Faire and golf, tennis and pickleball tournaments. A Veterans Day service was held in the ballroom with songs and thoughts of inspiration. SunBird Golf Club hosted its annual fantastic auction on the clubhouse patio that was largely attended. An excellent traditional Thanksgiving feast was served from the restaurant, breaking the record of the largest in attendance. Our Canadians came in big numbers to the annual Grey Cup party in the ballroom. December is also going to be an extremely busy month with .ariety of activities and events planned almost every day. It is a lot of work preparing, setting up, decorating and taking down many of these events. We appreciate all those club, group and staff members who organize and help with carrying out these activities that could not be done without them. 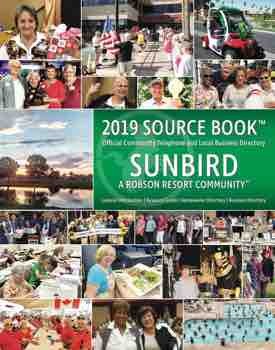 To keep up to date with all that’s going in SunBird, please refer to the monthly issue of the SunBird News, website at sunbirdhoa.com, register with our email blast or just come to the clubhouse to pick up monthly calendars and flyers of all the events. We wish you a wonderful and happy holiday season.